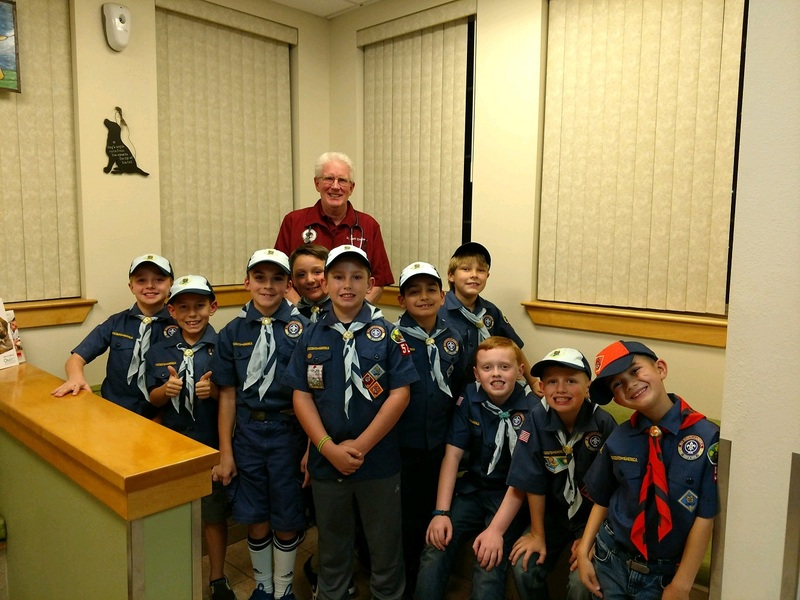 Boy Scout Pack 522 came to Rialto Animal Hospital for a tour of our hospital. As part of their badge earning requirements, they also got to interview Dr. Creswell about being a veterinarian. We certainly hope we have inspired a few of these wonderful boys to consider a career helping animals! These boys were a pleasure to have and they put quite a few smiles on faces here! In addition, the Pack decided to thank us for the tour by donating some cozy blankets they made for our patients... so you know who to thank when you see your fur-baby cuddled up on a beautiful handmade blanket! Thank you Pack 522!! Girl Scouts visit Rialto Animal Hospital!! Recently, we had a Girl Scout troop visit our hospital. The girls took a tour and learned about different aspects of the medical care that is provided to our patients in the hospital. They were able to view x-rays of broken bones and a pregnant dog (and count how many puppies she was expecting!). The girls participated by bandaging their stuffed animal's legs and took turns listening to our mascot dogs Maverick and Montana's heartbeats using a stethoscope. They examined external parasites, dog teeth and models of dog anatomy. More than a few of the girls have decided that they want to be Veterinarians when they grow up. If you lead a girl or boy scout troop, or other type of extra-curricular group of kids aged 10 and under, and are interested in visiting our hospital as a field trip, please contact Lisa, Alondra, or Sherry. We appreciate our invitation to Sierra Lakes Health Fair!! We had a great time educating the parents and children of Sierra Lakes about zoonotic diseases (diseases we can catch from our pets!) and ways to prevent them in order to keep the family healthy and their pets protected. The highlight of the night were the dog teeth we brought from the numerous dental extractions we've performed over the years--the kids were fascinated by them!